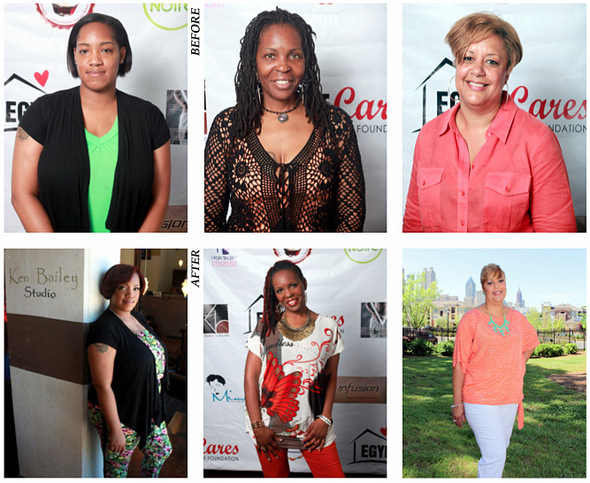 (Atlanta, GA) — In honor of Mother’s Day, Egypt Cares Family Foundation in partnership with Ken Bailey Hair Studio presented the 5th Annual Egypt’s Mommy Makeovers Celebration on Wednesday, May 7, 2014. Three deserving women from throughout the Atlanta metropolitan areas were selected to indulge in a day of pampering, relaxation, and life changing transformation from head to toe by some of Atlanta’s top hairstylists, makeup, and beauty providers such as: Bridgit Crider, Mimi Armstrong,Tiffany Leake Hunter, Tiffany Mapp, and Sandye Lomax. While receiving their beauty transformations, the winners enjoyed catering provided courtesy of Chicago Nancy’s Pizzeria of Buckhead. As a keepsake from the day of beauty, the winners received a glam photo shoot by Michael W. Eaton Photography. To compliment their outfits of choice, Ebone’ Smiley provided jewelry styling courtesy of Stella & Dot. As the winners were to reveal their looks, they were surprised by Tameka Raymond (Notable Fashion Stylist/Entrepreneur/Philanthropist). To complete the day, the women were whisked away in style by Divine Chariots Limo to a private dinner at Atlanta’s Infusion Bistro. At dinner, they were joined by Atlanta’s WXIA NBC 11Alive News Anchor, Demarco Morgan. “Every year, it’s a challenge for us to narrow down winners after receiving hundreds of submissions. But we felt these three mothers had been through the fire and back and deserved this special opportunity to be pampered,” says Egypt Sherrod. The 5th Annual Egypt’s Mommy Makeovers Celebration was made possible through the generous contributions from: Ken Bailey Hair Studio, I For Talent Management & Consulting,KDuJour Events, DeMarco Morgan, Luxe Sound Entertainment, Tiffany Leake-Hunter, Michael W. Eaton Photography, Chef Jason Ellis, Infusion Bistro, DJ Fadelf, SJ Oglesby PR, Chicago Nancy’s Pizzeria Buckhead , Bridgit Crider, Beauty Fetish, VBar Lady, Eboné Smiley – Stella & Dot, Mimi Armstrong, Tiffany Mapp, Miss Jessie’s , Ooh La La Fashion Boutique, Red Velvet Mama, SoRen Tea, MommyNoire and Divine Chariots Limousines. For more information on Egypt Cares Family Foundation, please visit www.EgyptCares.org. For more information on Egypt Sherrod, please visit www.EgyptSherrod.com or www.EgyptSaidSo.com, Twitter: @EgyptSaidSo, Instagram: @egyptsherrod, and Facebook:www.facebook.com/EgyptSherrod.